Buying your wedding dress is one of the most momentous and exciting parts of organizing your wedding. One way to make the whole experience more magical is to do some homework before hand and decide what styles you like and what you want to avoid. With so many options out there, narrowing it down is key to finding your perfect dress. To help you find “the one,” here are some of the styles and dress elements we think you should consider. Lace wedding dresses are exceptionally popular, which means you’ll have lots of choice when you go dress shopping. 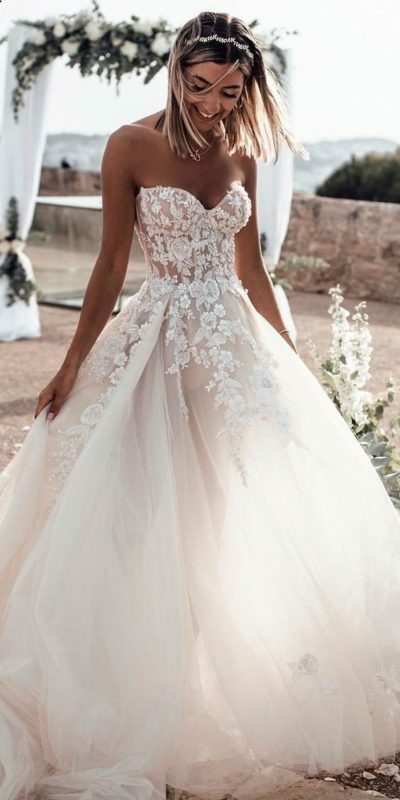 On the other hand, if you want an off-white wedding dress, like ivory or blush, that will narrow down your search since not all gowns come in off-white. 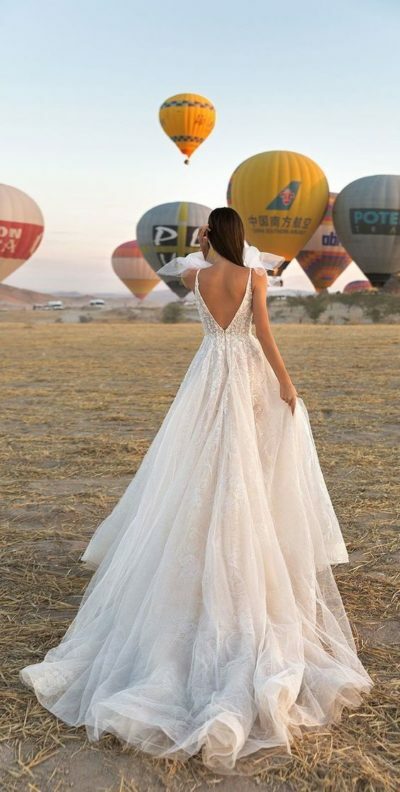 Either way, choosing a gown with lace or in an off-white colour will really make your photos pop. After Meghan Markle chose a simple wedding dress, with no embellishments or sparkle, brides have been ditching diamonds and choosing much simpler styles and silhouettes. This trend is great for women of all sizes, because a bigger skirt creates a smaller waist and more of an hour glass shape. This means any bride can look and feel amazing on her day in a simple A line style. One element that will really packs a punch on your big day is a long train. If you have your heart set on length, ask the assistant helping you at the wedding salon to pull dresses with long skirts and trains. Just the feeling alone, while you walk through the shop wearing it, will be incredible, even if you ultimately opt for another style. You don’t see many halter wedding dresses these days, which will definitely decrease your options significantly. If you’re open to all sorts of neck lines, just ask the shop assistant to choose the most unique or creative silhouettes in the store and you’ll end up with something stunning. For a beach wedding, barn yard wedding, or outdoor park wedding, you don’t want a heavy wedding dress fabric making you sweat off your makeup. Ideal for petite brides, cotton, crochet and other unique linen options exist to give you a much more bohemian look. Which of these styles is your favourite? Let us know on social media.